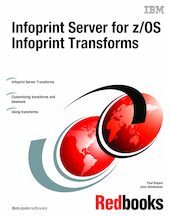 One component of Infoprint Server is the Transform Interface. This component communicates with transforms that IBM transform products provide. Transforms convert data from one format to another, for example, from PDF to AFP format, or from AFP to PCL format. Administrators can set up the transforms to automatically transform documents before they are printed. Users can also use the z/OS UNIX command line to transform documents, which can then be saved in the converted format and later printed or sent to other users.